Read here about the MOOM pavillion, a tensegrity membrane structure erected in Noda, Japan. Designed by C+A Coelacanth and Associates, and called the "MOOM tensegritic membrane structure." 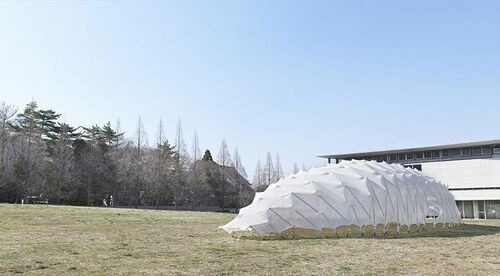 In Noda, a city located in the far northwestern corner of Chiba Prefecture, Japan, one of the partners of C+A coelacanth and associates, Kazuhiro Kojima, led a team of 70 architectural students at the Tokyo University of Science in the design and creation of an experimental, lightweight, load-bearing structure for a temporary pavilion. The 26-meter long, up to 7.5-meter-wide and 4.25-meter-high volume is self-supporting and is comprised of solely two components: metal nodes and a delicate elastic polyester skin, only 0.7-mm thick. The airy structure was erected in one day, using a tectonic system of a membrane is pulled over aluminum tubes that create a tensegrity system. The 131 bars are various lengths and do not touch, opting to create a synthesis of skin and structure via a system of sewn-on sheaths that the structural modules slide into. The structure is not completely self-structuring, and relies on gound-based anchors, altered aluminum tubes used as pegs. The total form weighs a mere 600 kg, however it covers a ground area of 146 square meters. 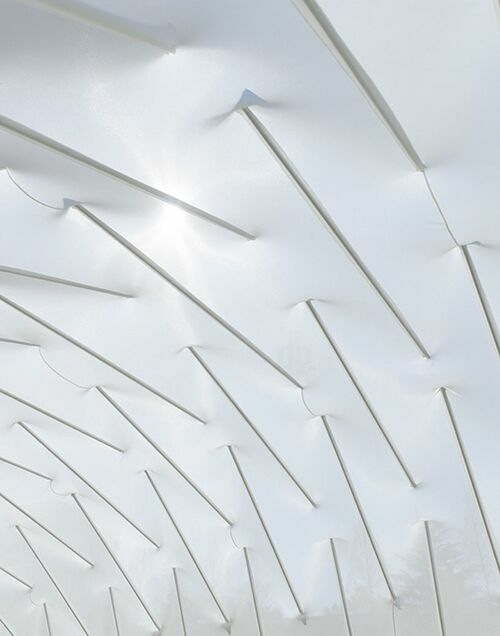 Since the membrane screens off 80% of the UV radiation, but allows 50% of the daylight to pass through, the softly filtered light creates a fascinating spatial impression internally. When illuminated, the translucent pavilion has the appearance of a lighted sculpture. The pavilion admits an ample amount of daylight while pointedly shielding from UV radiation; the effect is one of ethereality, tectonically manifested as a swathe of diffused light. at night, the relationship of node and skin reverses and the nodes create a pattern of fractured ribbing. Video by Shinken Chikusha. 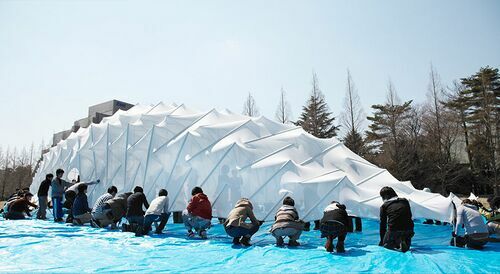 media type="file" key="MOOM pavillion time lapse 2011 Japan.mp4"
media type="file" key="MOOM Tensegritic membrance structure timelapse 2011.mp4"
For other membrane structures, see membrane. This page was last edited on 28 January 2019, at 10:38.